Both men were fatally injured in the smash, which happened at around midday. Fifteen people have died and six are missing after flash floods hit the Macedonian capital of Skopje. At least 300 migrants have been injured after violent clashes with authorities at the Macedonian border with Greece, charity Médecins Sans Frontières‎ (MSF) said. Authorities in Macedonia have been accused of using "dangerous and deplorable" force against migrants protesting at the Greece's border town Idomeni. "The situation was extremely tense this morning, when tear gas, rubber bullets and stun grenades were used in the camp to disperse crowds. The MSF teams treated 300 people, among them 200 with respiratory problems after being subjected to teargas," the charity said in a statement. Police sources say tear gas was fired only after migrants stormed towards a border fence on Sunday. The EU is now deporting new arrivals to Greece back to Turkey if they don't meet asylum criteria after agreeing a deal with the country. BREAKING: Chaos at #Idomeni today as authorities fire tear gas/rubber bullets/stun grenades at those trying to force their way in #FYROM. Greece has described force used by Macedonian authorities against protesting migrants at the country's border "dangerous and deplorable". Some 600 migrants who crossed the border into Macedonia have been sent back to Greece, a police official said on Tuesday. Most of the migrants were taken back to Greece on Monday or overnight on trucks, the official said. More than 1,000 migrants and refugees marched out of the Idomeni camp near the northern Greek border on Monday and crossed a fast-flowing river in an attempt to cross the Macedonian border. Last week, Macedonia and other nations blocked the route north along the so-called Western Balkan route. Hundreds of migrants defy a border closure at the Macedonian border and cross a fast-flowing river to make their way into the country. Over 30,000 refugees and migrants are reportedly stranded at the Greek border with Macedonia. According to the UN Refugee Agency "the situation is quickly deteriorating" with tens of thousands of people trapped at the border and "sleeping in the open without adequate reception, services, aid or information" as borders remain closed along the route they would take to Europe. Migrants stranded in Greece because of border closures are protesting by lying across train tracks. It comes as hundreds remain stuck at the port of Piraeus, near Athens, while more than 10,000 are currently stuck at the Greek border with Macedonia. Thousands of migrants are trapped in Greece as borders remain closed along the route they would take to Europe. 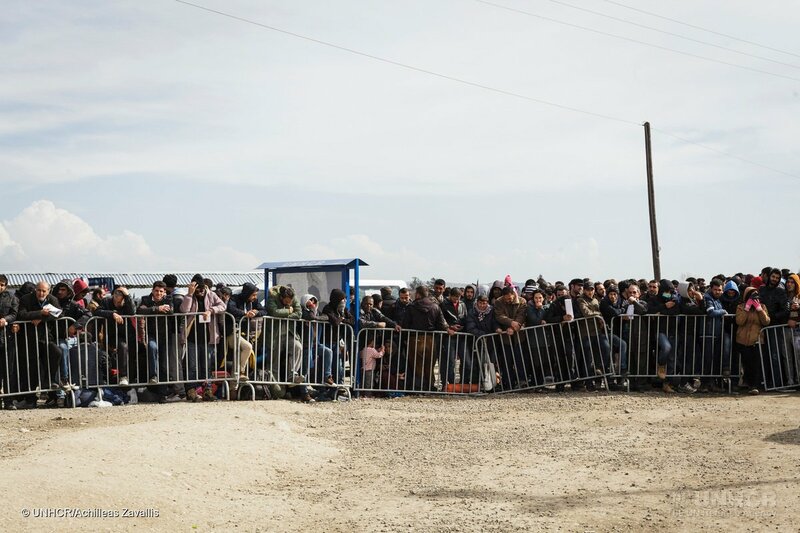 Barely 200 refugees were allowed to trickle across the Greek border into Macedonia. Around 10,000 more are waiting in a crowded tent camp on the Greek side of the frontier tonight - with no sign from authorities that they are going to be allowed to travel any further into Europe.